The theatre has been a perennial subject for literature, and for drama itself, at least since Shakespeare wrote A Midsummer Night’s Dream and Hamlet. The movies have been drawn to backstage stories since the silent days, elaborating on the form with behind-the-scenes films set in movie studios (from Anthony Asquith’s remarkable Shooting Stars up to this year’s Hail, Caesar! by the Coen Brothers) and any number of putting-on-a-show musicals in the ’30s. It’s not hard to see the attraction of these stories: they throw into focus themes of artifice and reality, of life as performance, and the ways in which we construct the narratives we inhabit. With their new Blu-ray release of Kenji Mizoguchi’s The Story of the Last Chrysanthemum (1939), Criterion have made available an early masterpiece by one of Japan’s greatest filmmakers, best known for a remarkable series of features he made in the ’50s – The Life of Oharu, Sansho the Bailiff, Ugetsu and Street of Shame among others. Those films were distinguished by his long takes, mobile camera, fine attention to detail and (like Yasujiro Ozu and Mikio Naruse) a deep empathy for the lives of women in traditional Japanese society. Many of Mizoguchi’s stylistic characteristics were already being forged in the late ’30s and are on full display in Last Chrysanthemum, a story set in the late 1800s, in the middle of the Meiji period which marked the transition from feudalism to modern empire. This is the story of Kikunosuke Onoe (Shôtarô Hanayagi), the adopted son of kabuki master Kikugoro Onoe (Gonjurô Kawarazaki). Kiku is being groomed to take his father’s place, but is falling short; he spends his time partying with geishas and getting drunk instead of honing his talent. He is fawningly flattered to his face by sycophants who ridicule him behind his back. The only one who can see his potential is Otoku (Kakuko Mori), a servant girl who works in his father’s household. Although she is socially far beneath him, her devotion spurs him on, eventually inspiring him to rebel against his family, to strike out on his own. 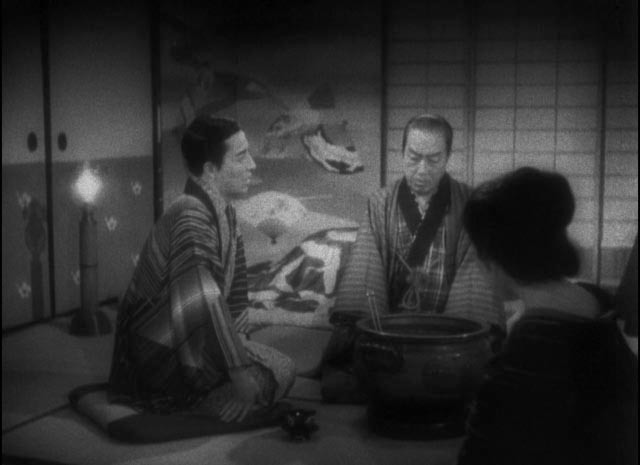 The film chronicles his professional vicissitudes in parallel with his difficult relationship with Otoku, who joins him despite the opposition of both their families. Kiku sinks into obscurity and poverty without the support of the family name, reduced to the lowest levels of theatre as a member of a traveling company, eventually cheated and abandoned by their manager. And yet he gradually reshapes himself until he emerges as a master of kabuki in the role of Sumizome, a geisha who is also a tree spirit, returning in glory to his family for a reconciliation. But all this is at the cost of the health, and finally the life, of the woman who has sacrificed herself in order to transform him into a genuine artist. It should be clear from all this that the off-stage story of Last Chrysanthemum is heightened melodrama, a stew of family conflicts, broken romance, destructive pride and redemption. Kiku is a man torn between normal appetites and the stringent demands of art; Otoku is his muse, an adoring woman who lives to nurture his latent greatness and ultimately dies to make him what he must become. 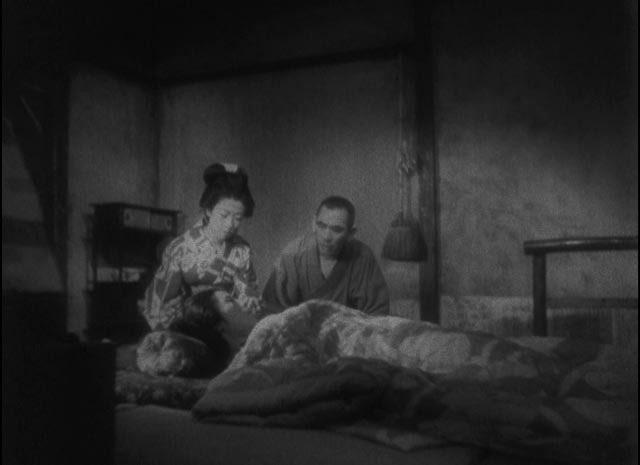 It is here, in her character, that it seems that Mizoguchi has not quite reached maturity as an artist himself; Otoku, unlike the strong and determined women in many of the later films, remains something of a passive prop holding Kiku up. Although the theme of a man discovering his authentic self through performance seems familiar, the film presents some difficulty for a western viewer unschooled in the highly ritualized forms of Japanese theatre. If the messiness of “real life” obscures essential truths about the protagonist’s character, Kiku’s performance as Sumizome seems distant from our experience, or rather is more akin to dance than drama, leaving those inner truths only partially accessible. Although the tradition of male actors performing female roles is as much a part of western theatrical history as it is of Japanese, is the choice of this role more than a mere historical detail? Kiku finds himself, finds the full depths of his talent, in becoming a female figure for his enthusiastic audience. In a sense, he takes on a power denied to Otoku, who in effect transforms him with her own sacrifice. Underlying the more obvious melodrama are intimations of gender ambiguities which may be inherent in the culture which shapes these characters’ lives. 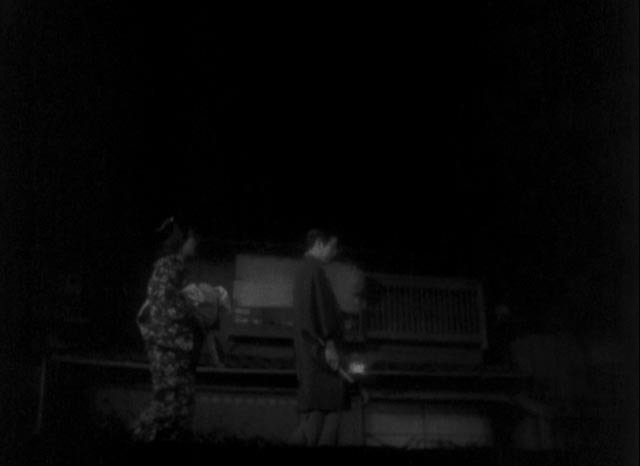 But if this dimension of the drama seems not completely formed, the film itself is stylistically masterful. Mizoguchi has a remarkable sense of architectural space, composing scenes in depth with multiple planes of action contained in frames within frames, through doorways and windows and the gaps in screens. He evokes not only the chaos in the spaces behind the theatre stage which feeds into the controlled energy of the performance itself, but also the subtle gradations of power within the family home. He uses a highly mobile camera, carefully re-framing the action and the character relationships within shots which are frequently uninterrupted by cuts for minutes at a time. 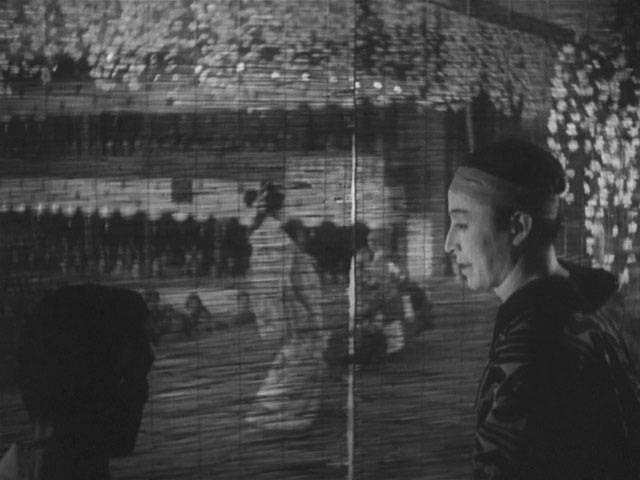 Through the melodramatic narrative, Mizoguchi creates a multi-dimensional portrait of a specific time and place, and while that narrative seems to reach a conservative conclusion in which society’s formal structures of authority and submission are reaffirmed, there is an implicit critique in the depiction of the cost of that kind of stability in the sacrifice of Otoku who, for all her passivity, remains the film’s most sympathetic, unaffected and honest character. Given the film’s age, and the fact that it was completed shortly before the Second World War, it is not surprising that the image quality is compromised. Transferred in 4K from a fine-grain positive and a duplicate negative, the image shows a great deal of wear, with scratches and grain prominent throughout. The picture is quite soft and the contrast occasionally weak, with poor detail in shadows and brighter areas of the frame. But these technical weaknesses can’t diminish Mizoguchi’s impressive abilities with the camera or the essential power of the drama. The soundtrack exhibits noticeable hiss throughout, but dialogue is generally clear. The disk offers only one extra, an interview with critic Phillip Lopate (21:19), who provides background information about Mizoguchi and the period in which the film was made, and goes into detail about the evolution of the director’s distinctive style. The booklet essay is by film scholar Dudley Andrew. This entry was posted in Review and tagged Blu-Ray, Classics, Criterion, Directors, Japanese Film. Bookmark the permalink.